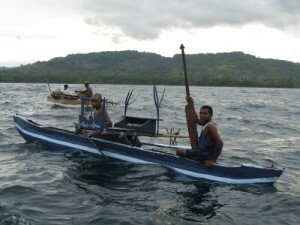 Ephraim and Levilevi were the first ones to reach me in their canoes. 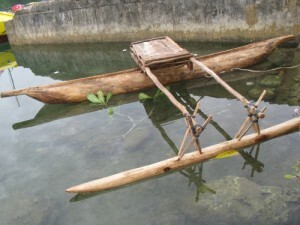 The dugout canoes had a pontoon on the side held in place by cross beams and sticks tied together by twine. This is my fourth morning sleeping tied to a wharf. My boat is not rocking to awaken me. I do not have to wake up every half or one hour to monitor where land is. I do not have to row despite my sciatica ache and I can take my time to do anything physical. And most importantly, I am finding new friends, meeting kind people. I delivered my boat on the 20th day, just before sunset on Wednesday the 5th to the wharf at Finsch Harbor, located just 5 nm north of Dreger. 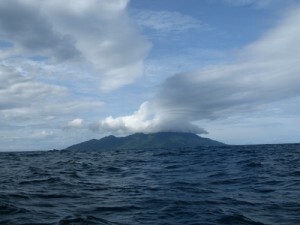 Dreger is where the Vitiaz Strait ends and the coastline turns west toward Lae. 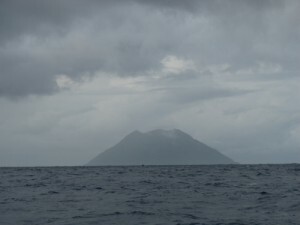 At 18:21 PNG time (08:21 UTC 02/04/2009), with 779 nm on my odometer, I tied my boat to the small wharf with curious onlooking children and adults gathered. In addition, the smaller Dreger entrance was just south of the Mape River, the effects of which on my approach uncertain. The river flowed into the widening Langemak Bay. I thought that I should row into the bay some to compensate for the river's flow, so I would not be pushed offshore just when I needed to line up my approach precisely for the harbor's entrance. Dane Clark had shared a story about the currents and eddies of the Mississippi delta which had created problems for another adventurer. I knew of the treacherous conditions that the strong flow of Columbia River creates on the Oregon shores when also coupled with the tides. Mape was neither of these in size, but was still an unknown for my low horsepowered craft. Looking behind me over the bow, I could spot a structure to my south in the Finsch Harbor bay which was wide open to an easy northerly approach. It would be very easy to get in this bay, but with prevailing winds and swells, it would be very difficult to get back out. Chartplotter indicated buildings, a wharf and a jetty. If I could not find a place to tie, I could perhaps anchor. I wondered if I could walk from here to Dreger; there seemed to be a coastal trail marked on my chartplotter from Dreger to Lae. The uncertainty bothered me, I decided to bypass and continue to Dreger. I was quickly approaching the point of no return if I wanted to avoid the Cape Bredbow guarding the harbor entrance on the east side and to continue toward Dreger Harbor another 5 nm down the coast. Running on the outside of the cape, I could parallel the shores of Nugidu Peninsula which formed the eastern wall of Finsch Harbor. Two traditional dug out canoes appeared to my starboard side which had launched further south, as the two distant silhouettes continued to close in from my starboard stern. In their elongated slender hulls, these men had a light and nimble craft which they moved easily among the swells with just one paddle. The canoes had one side pontoon each, which was a solid piece of wood, about 2 meters long and perhaps 20 cm in diameter. It was held in position about 2 meters to the side paralleling the hull by two cross beams. Eight sticks were pounded into the holes drilled on the top side of the pontoon, four in the front and four in the back. The holes were drilled at about 45 degrees and in pairs, so that the two sticks came together at about 90 degrees perhaps 30 cm above the pontoon, then tied with twine to each cross beam. The pairs of sticks were tied about 20 cm apart on the beam, to give the pontoon further stability. This strong yet sufficiently flexible method of securing the pontoon was ingenious. [ORS MAP] link on the top right should be working now. You can check my location there.